Surely one of our best selling mens tungsten wedding bands, the single bevel brushed tungsten carbide ring is classic and timeless. The simple yet elegant design is perfect and sets the standard for all mens and womens wedding bands. 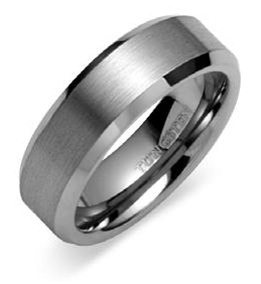 This tungsten carbide wedding band comes at a discount price and is offered with comfort fit in all sizes and half sizes ready for same day free shipping.